How has your studies at WIT helped you to get where you are today? The BSc (Hons) in Agricultural Science course at Waterford Institute of Technology has provided me with extensive knowledge into the agricultural industry through broad spectrum of modules provided. In WIT there is a pleasant variation between theory and practical learning which is very important. Modules have been carried out in animal and crop production, grassland and soil management, food science, food processing, environmental science and business management. The BSc (Hons) in Agricultural Science course at WIT is often practical based which personally, is very beneficial. Throughout the duration of the course many field trips have been carried out in numerous modules. Trips to Teagasc centres, farms, catchment areas and food processing factories have all been constructive in the progression of my studies as they gave an opportunity to apply in-class material and a more hands-on approach. Kildalton Agricultural college also played an significant role in my study, helping me progress to where I am today. The modules carried out in Kildalton were practical based and of utmost importance as a foundation for any Agricultural degree. Did your work placement / internship or contact with the Careers Centre help get you to where you are now? I engaged in an intensive work placement on a 1,000 cow dairy farm in Canterbury, New Zealand in 2016 for 6 months, which provided me with great insights into animal nutrition, animal husbandry, grazing management and grass production. Grass utilisation and grazing management in New Zealand is exceptional and as a result animal performance and production is high. The first hand experience I gained in dairying and the knowledge I obtained from it was unbelievable. This placement gave me the opportunity to put what I had learned in the previous three years into practice. Why did you choose your course/ to study at WIT/ study in Waterford? I come from a small suckler and beef farm in Corofin, Co. Clare. We have 25 spring calving suckler cows, mainly Limousin and Charolais cross cows. All calves are kept for a winter and sold as stores. Farming from a young age and growing up on a farm triggered my love for agriculture. I attended secondary school at St. Flannan's College, Ennis, Co. Clare. From there I needed to decide what area I wanted to pursue as a career. Agriculture seemed to be the path for me. I always had a love and passion for agriculture and farming but since embarking on the agricultural science course in Waterford Institute of Technology I have fostered a desire to succeed in this growing and evolving industry. What advice would you give to students considering your course? I believe if someone has passionate desire for agriculture and a dedicated zeal for the evolving industry, the Agricultural Science course at WIT is the perfect choice. The course has a broad blend between theory and practical learning that is invaluable. At first, I was apprehensive about lab work and the science modules but I readily applied myself and overcame these concerns with ease. Upon reflecting on my previous four years in the the Agricultural Science course at WIT, I would advise participants to value, persist and excel during work placement. Personally, travelling to New Zealand and working on a dairy farm provided a unique experience, one which was central to my work at WIT. Choose an area you have an interest in and pursue it. Everyone has an interest, passion or area that excites them. I would advise not getting too consumed on points and grades when leaving secondary school. if you have a dream, the whole world will conspire in helping you achieve it. Did your course include work placement? If so where did you do it? What was it like and how has it been of benefit? I engaged in an intensive work placement on a 1,000 cow dairy farm in Canterbury, New Zealand in 2016 for a period of 6 months. I was provided with rich insights into animal nutrition, animal husbandry, grazing management and grass production. Grass utilisation and grazing management in New Zealand is remarkable, and as a result animal performance and production is high. I gained a great deal of experience and obtained a wealth of knowledge in dairying, thus, in conjunction with my college coursework, gave me the opportunity to put what I had learned into practice. I was recently granted the Dairymaster Student Award for my thesis. 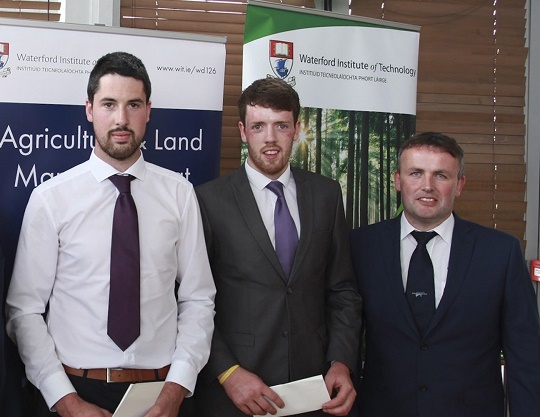 Six students were shortlisted from the BSc (Hons) Agricultural Science class, two chosen for the award. It was a tremendous honour to win the award while in the presence of other exceptional projects. My thesis, titled, 'Different performance and sward characteristics of five contrasting swards of different ages but composed of the same grass mixture', provided the opportunity to portray what I learned over the past 4 year in WIT. In my project I compared the productivity and value of different ages grass swards from new reseeds to a six year old sward and all the years between. I compared and measured the variations in the sward in relation to its age and examined dry matter output, growth rates, protein output, leaf proportion, ash content and tillering of the varying grass ages. From my findings I backed up the argument that swards should be reseeded every 5-6 years in order to keep to productivity. Grass production, productivity and animal performance are all areas which particularly interest me and are areas I would like to pursue a career in in the future.